Last season’s runner-ups Tottenham comfortably saw out 10 man Newcastle upon their return to the premier league at St.James Park. After an uninspired first half, the second burst into life as Jonjo Shelvey was red carded for Newcastle.Tottenham with their man advantage went on to dominate the match from there on and comfortably sealed their win via goals from Delle Ali and Ben Davies. The Newcastle team along with manager Rafa Benitez received a rapturous applause from a St.James Park filled to the rafters as they made their return to the premier league having been relegated in 2015-16.They were successfully lead to the championship title last year which meant them gaining direct entry to the premier league. 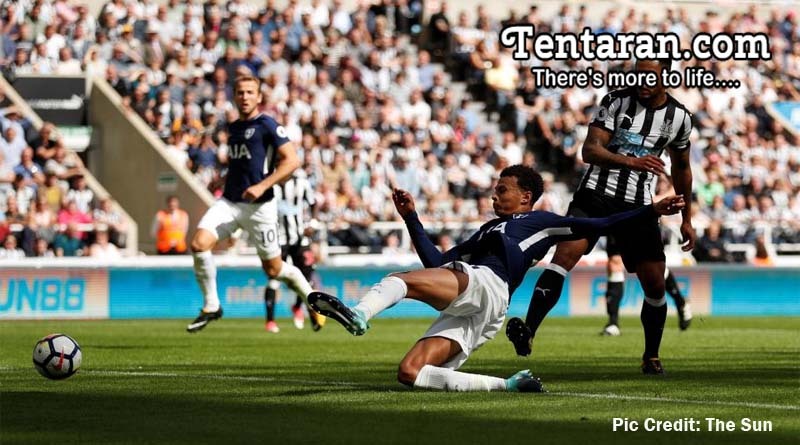 Despite the displeasures of Benitez on Newcastle’s inability to add quality to the current squad, Newcastle started the match well, defending resiliently against Tottenham in the first half. The first half failed to inspire, as neither side got into their attacking groove and were unable to create any meaningful chances. Newcastle’s stand-in captain Jonjo Shelvey soon had his annual moment of madness early into the second half, he received a straight red card for treading on a prone Ali, paving the way for a comfortable victory for Mauricio Pochettino’s side. Having comfortably defended up to that point, the number disparity was too large a task for Newcastle to deal with. Christian Eriksen opened the Newcastle defense up with a sumptuous cross that was volleyed in by the mercurial Ali. Eriksen delivered another peach of a ball which was latched onto by defender Davies and thumped into the back of the net to hand the victory to Tottenham.